Congratulations to all the concerned for this marvelous achievement! I also pray and hope that the other Provincial Govt. (s) will soon follow this president in other to bring justice among the masses at large. Once again I appreciate all the concerned who worked hard in this regard. Especially efforts made by Khalid Riaz are above board by all means. Congratulation first of all to Mr.Khalid Riaz hero of the all play bignning to the end of the case and his team in the result of their lengthy and fruitful struggle and after that congratulation to all of my colleques in KPK,and hope that all other provinces will be also taken action as the same as soon as possible. KPK k bhaiyun ko bahut bahut Mubaarak ho. 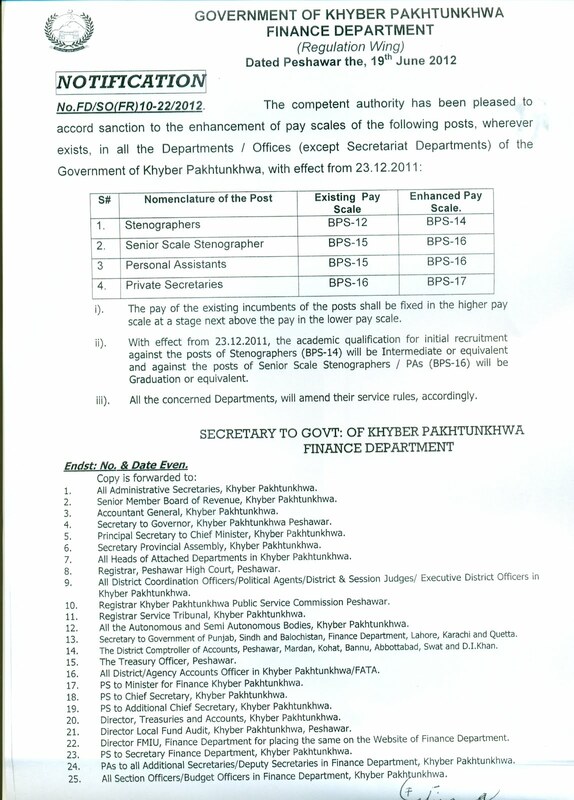 Congratulation to all Stenographers/PAs/PSs of Khyber Pakhtunkhawa for up-gradation of posts w.e.f. 23.12.2011 especially to Mr. Khalid Riaz and President KPStenographers Association Mr. Muhammad Anwar Khan Banvi. 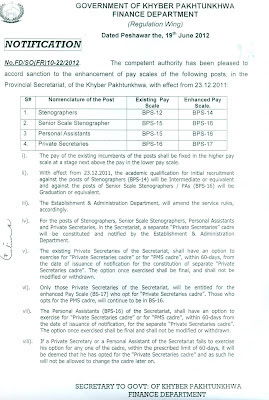 I hope now, other provinces will up-gradate of posts of Stenographers like KPK. 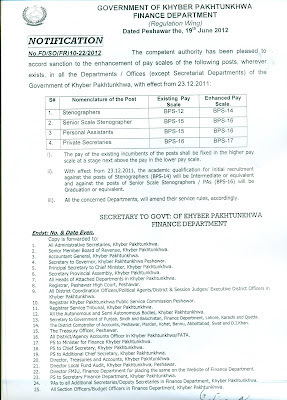 I also appreciate Provincial Government of KPK. First of all, I congratulate all the KPK stenos on the upgradation and especially KPK government for implement the order of supreme court of Pakistan. Secondly I want to ask Mr. Mughal that few months back you sent an email to Chief Justice of Pakistan with the request to take Suo Moto Notice because the punjab government is not taking any positive step for upgradation the case of stenographer, the Registrar, Supreme court ordered the Finance department, government of punjab to report the registrar office about the upgradation case upto 24-4-2012 but i have been observing that a lot of time has been elapsed but no action has been taken from supreme court of pakistan on its notice, whether finance deptt. submitted its report to Registrar, supreme court or not. I just want to know that what is the latest situation regarding upgradation in punjab province. I also read your various letters which are lying on the blog www.pbcssa.com in which your goodself requested to Chief Minister Punjab for a meeting or constitution a committee but both proposals are rejected. Mr. Mughal I am not denying the facts and I really appreciate your keen interest and your hard working but I can't understand why did you write a letter to Mian Muhammad Nawaz Sharif for giving time. In my point of view, you have only one way and this is the way of proceeding in the court of law with "the order of supreme court of pakistan, order of finance department government of pakistan, suo moto action from the supreme court of pakistan and now recently issued notification from the KPK government. Dear abhi tak 5chon sobey aik dosrey ka intezar kar rahe the. Abhi Khyber pakhtunkhwa ka Notification un ke hath lag giya ha. Waqi es ma bohat bare masley the jo hum ne Hal karwai hain. Abhi Notification ho giya ha aur sub clear ha baqi sobey esi ko implement karin ge. On my request to Supreme Court, the Finance Department had submitted reply to HRC Supreme Court after elapse of more one month of target date in negative shape that they are not bound to obey the orders of federal. On this reply, I again requested to HRC Supreme Court that reply of FD is not on the fact. I quoted so many precedent wherein FD has implemented the notification of federal but in our case, they are vehemently denied but uptil now HRC Supreme Court not taken any stemp on my request. so far as concern of writing to Mian Nawaz Sharif, it is stated that we are trying in every forum. Dears..... As you are well aware that at Federal Level Mr. Khalid Riaz play a vital role on upgradation of stenographer's community, however, in Khyber Pakhtunkhwa, Mr. Masal Khan, Senior Vice President, Khyber Pakhtunkhwa Civil Secretariat Stenographer's Association has play the same role. We all provincial Govt. employees appreciate his efforts for stenographer's community. my question is that are we upgraded or not.please guide & suggest what can i do. 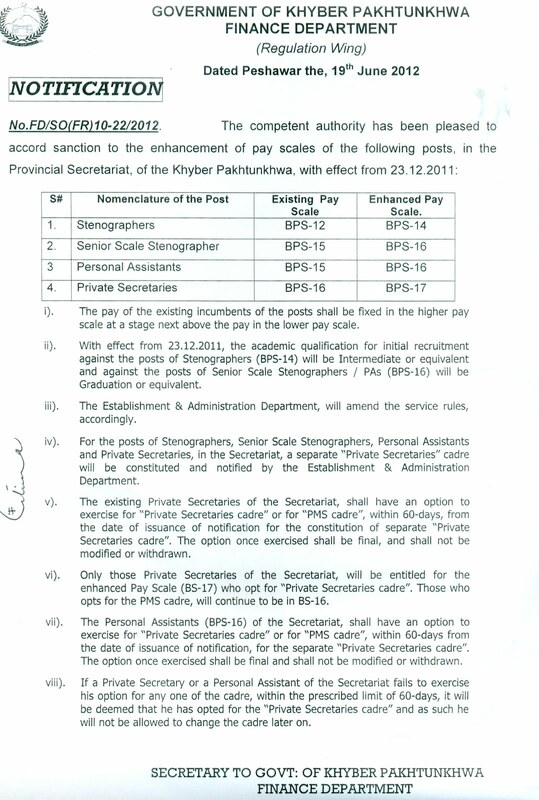 or any other information relating to selection graded stenographer.